Christian Law School Denied Accreditation Over Potential “Harm” to Homosexuals | Have Ye Not Read? 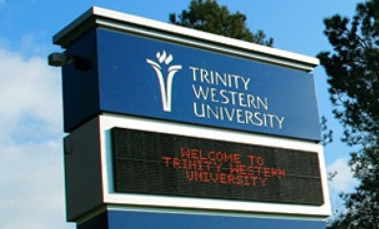 According to this news article, a private Christian law school in Canada has been denied accreditation because of its requirement that students agree to reserve sexual intimacy for marriage and keep marriage between a man and a woman. While lower courts affirmed the right of the school to set their own policies in line with their religious beliefs, the case was continuously appealed and eventually went all of the way to the Supreme Court of Canada, which ruled the school’s “lifestyle covenant” to be “exclusionary,” and therefore could cause “harm” to homosexuals. “Limits on religious freedom are often an unavoidable reality of a decision-maker’s pursuit of its statutory mandate in a multicultural and democratic society. “According to the Bible, sexual intimacy is reserved for marriage between one man and one woman, and within that marriage bond it is God’s intention that it be enjoyed as a means for marital intimacy and procreation. So now the Supreme Court of Canada has essentially ruled against religious freedom, chastity and Biblical marriage, in one fell swoop, and in preference to the “feelings” of homosexuals who might be “hurt” if they’re asked to live a moral life while attending a Christian school. It’s designed to force Christian organizations to renounce their Bible-based policies and accept wickedness and immoral behavior as part of their very structure. And the homosexuals and their ilk are not going to stop until they achieve exactly that. What must Christians do? It’s simple. You have to make a decision. You have to decide whether to cave in to the world and its debauchery, or stand in solidarity with God and His Word. As the days go on, and the sand in the hour glass of time continues to run out, this is going to become a defining decision of your life.